From Victoria BC’s Driftwood Brewing comes the “Bird Of Prey” a re-release of Driftwood’s first every Sour Ale a Flanders Red Ale. 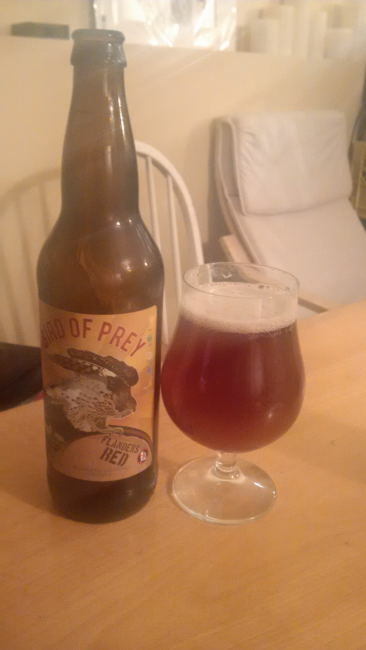 The original release came out in November 2011 and started their Bird Of Prey series of Sour Ales. This version was released in February 2014. This Flanders Red Ale pours a deep amber/red with an off white head. The aroma consists of sweetness, sour cherries, fruits, oak and mild funkiness. The flavour is of grape must, sour cherries, oak, tannins, candies, mild funky sourness. The beer comes in at an alcohol content of 7.5%. I think this beer will be amazing in a year or two with aging. Currently the flavours a muted and a bit muddled much like many very young sours. I have 5 bottles of this beer put away so I will keep everyone up to date on how this beer ages. I recommend picking up a few bottles and aging them. Commercial Description: The return of the original Bird of Prey from Driftwood Brewery’s Wild Ale series, this sour ale was inspired by a Coopers Hawk that took residence in the brewery for 24 hours in November 2011. Brewed in its honour, this very unique sour beer has been conditioned in a mix of American and French oak wine barrels for a year, creating a dry, sour & funky profile that will continue to evolve in the bottle for a very long time. This entry was posted in Barrel Aged, Flanders Red Ale, Imperial, Sour Ale and tagged barrel, barrel aged, bc, beer, canada, candies, candy, cherries, cherry, driftwood brewing, flanders red ale, funk, funky, grape, grape must, mild funk, mild funky, mild sour, mild sourness, oak, oak aged, oaky, re-release, sour, sour ale, sour cherries, sour cherry, sourness, tannin, tannins, vancouver island, victoria, young. Did you try this back in 2011? Can’t remember. I did and loved it. But my feeling about the 2014 is exactly the same as yours. It tastes different, like an immature red wine that’s still too tart and hasn’t fully developed its flavor yet. I had an unoaked version that was brought to the Albi Room last year that was brewed in 2011. Really good. This one is so young. It will be good in a year or two I think. I have 5 bottles so I will find out. Lol. Again, I admire your restraint. It will be easy to start as the beer really isn’t ready yet. Lol. Once it is it will be harder.